Complement the look of your home and property with a hand-crafted custom gate. 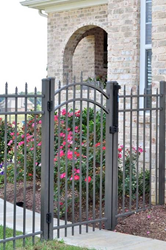 The material you select, be it PVC, Cedar or Ornamental Aluminum, along with the size and design of your gate, can be tailored to your specific needs and preferences. Not only will a custom gate protect your property, it will be the ultimate reflection of your personal style. Below are a few aspects of the multifaceted appeal of custom-made gates. There are few home improvement features as stylish, elegant, and distinctive as a gate greeting visitors to your property. Even better, every gate can be customized. What a perfect way for you to add your unique signature to the property you cherish. Not only are custom gates appealing to the eye and add a generous boost to your property’s curb appeal, they also provide an important layer of protection. In addition to the ‘beauty-factor’, many gates built by Wayside Fence Company are done so for extra reinforcement. When you are in the planning stages of designing your custom gates, be sure to mention your security needs to your gate and fence company. How warm and hospitable is a custom-made walk gate that leads to your door? How beautiful is a double-drive estate gate at the beginning of your driveway, welcoming your family and friends to your home? And how charming is an arbor or pergola, with a custom gate built within it that leads to a meandering garden path? All of these custom accoutrements allow you to further define and complement your property. 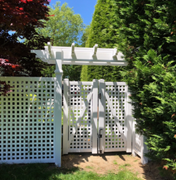 Since 1951 Wayside Fence has been the regional leader in PVC, Wood, Chain Link, Aluminum, Iron, Deer Fence, Arbors, Pergolas, Gates, Custom Work and More. If you’re looking for truly unique custom gates, please contact one of our Design Associates.